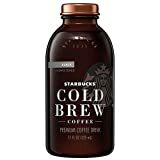 Starbucks Bottled Iced Coffees are designed to be a full flavored coffee experience as opposed to their other bottled coffee beverages. 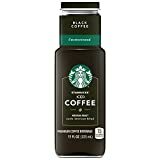 Many complaints with their Bottled Frappuccinos as well as their canned Double Shots centered around the weak coffee flavor as well as the overly sweet, artificial taste. 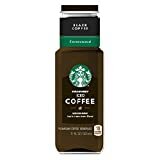 Starbucks Bottled Iced Coffee has a stronger coffee flavor, less sugar, and purer ingredients such as real 2% milk. Starbucks states that the caffeine content is approximate and can vary. How Does This Compare to Other Starbucks Drinks? Sugar content: 21 grams (per 11 ounces). How Does Starbucks Bottled Iced Coffee Compare? 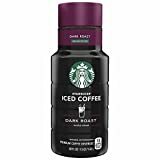 Starbucks Bottled Iced Coffee contains 10.00 mgs of caffeine per fluid ounce (33.81mg/100 ml).